I love running and have been doing it for a pretty long time so it’s just part of my daily routine. For me, it’s the best way to stay in shape, take a study break, and hang out with friends all in one. On those days when I’m tired of just going out and running by myself, there are a few different things I do to make it fun again. If you get bored when you run, maybe they’ll work for you, too! 1. Make a great playlist. Having new, upbeat songs to run to makes it so much more fun! 2. Run at your normal speed, and then pick it up every time the chorus of the song comes on. You get a great interval workout and you don’t have to worry about checking your watch to know when to speed up and slow down. I’ll do a mile or two warm-up, three miles of intervals, and a mile or two cool-down, but you can customize it to your distances. 3. Do hill intervals to mix things up. For a run like this, I’ll do a mile or two warm-up while I look for a good hill (which aren’t hard to find around where I live! ), run hard up the hill, jog down, and then turn right back around and run up again. Depending on the length of the hill, I’ll do 4-12 repeats, and then jog a mile or two of a cool-down. This might not sound fun but I promise it’s actually a fun way to change things up, and it’ll make you a faster, stronger runner! 4. Train for a race. I love training for a race because it gives my runs a purpose beyond just exercising. When I feel like slowing down, I remember my goals for my upcoming race, which really motivates me to keep going. Just for fun, a picture from my first half marathon. This ridiculous picture cracks me up because I look like I’m having the time of my life while I’m running with my eyes closed. 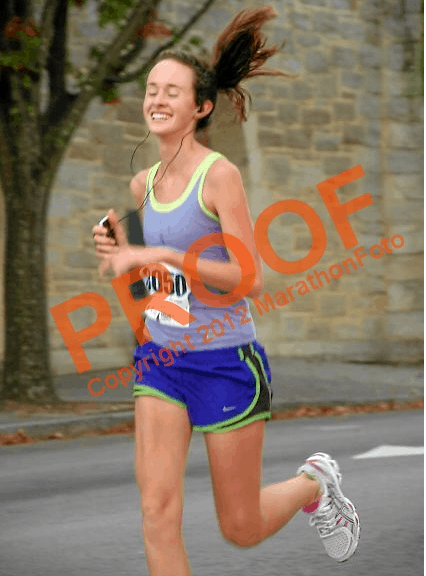 There are only 2 official pictures from that race and my eyes are closed in both of them! 5. Run with friends. I run with friends about 3 days per week and by myself with music about 3 days per week, and I love both kinds of runs, but my runs with friends FLY by. You get to know people so well, so fast when you run with them! 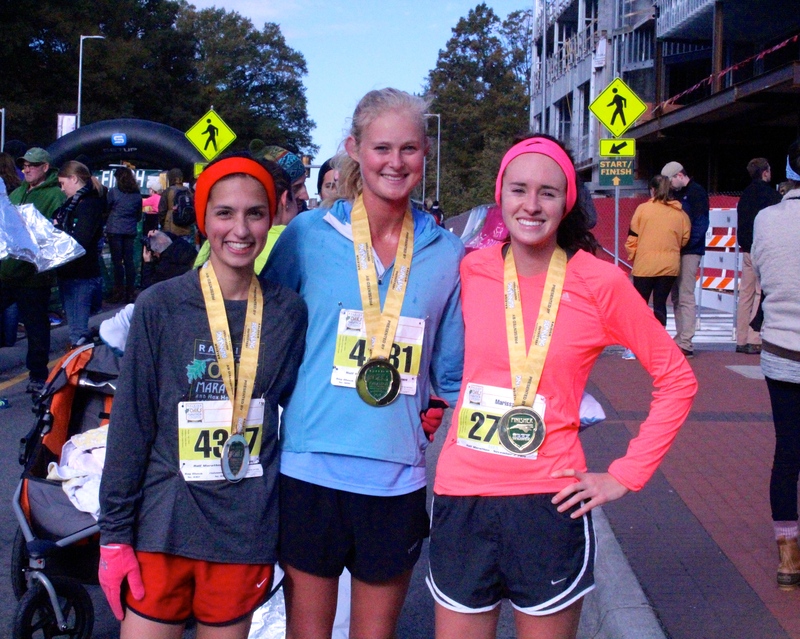 Plus, if you can find friends who are faster than you, they’ll push you to run faster, too. There’s no way I’d be getting up at 7 AM to run if I didn’t have these girls waiting for me! 6. Give yourself a destination. Having an actual place to go is fun sometimes! On a hot day, I might plan an out-and-back run that takes me to a water fountain. A few weeks ago, I had a cold, so I ran to Walgreens, picked up cold medicine, and then ran back to my dorm! I save runs like this for easy days so I don’t have to stop in the middle of a hard workout. 7. Hit the trails. The woods are really pretty to run through, even though I have a tendency to trip over roots. I also love running on Greenway trails because they’re so flat and there are no roots to trip over. I always run with someone else on trails, though, just to be safe! What are your favorite ways to mix up your runs? It is so fun to mix up your workouts. Running can get boring if you let it get boring, but running outside is my favorite. I never have been great at running with music. I prefer to run without music and enjoy the surroundings.